I started teaching two classes on technical analysis last week and will explain more of my concepts and include informational links, as many students will be new readers. My General Market Index (GMI) keeps me trading with the general market’s trend. The GMI is a count of 6 short and long term indicators. Because I like to trade growth stocks, the GMI focuses largely on the NASDAQ 100 stocks, as measured by the ETF, QQQQ. The Successful New High Index measures whether stocks that hit a new high 10 days ago have risen since that time. Since I trade stocks at or near new highs, I also like there to be at least 100 new highs in my stock universe of roughly 4,000 actively traded stocks above $5. My daily QQQQ and SPY indicators measure these indexes’ short term trends. 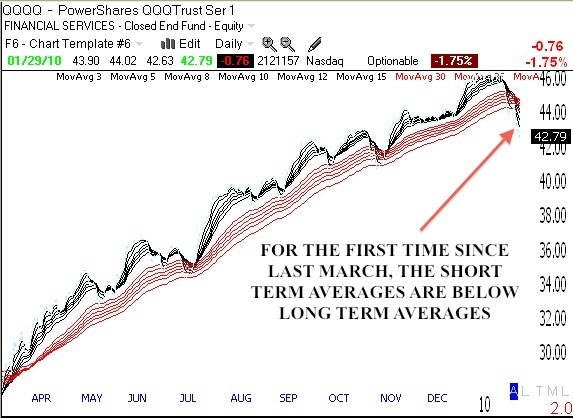 The weekly QQQQ indicator is my measure of the longer term trend. Weekly charts provide me with a more interpretable and reliable picture of the market’s trend. Finally, my IBD Mutual Fund Index indicator tells me how well growth funds tracked by IBD are doing. If funds that invest in growth stocks are doing well, I am also more likely to make money trading growth stocks. 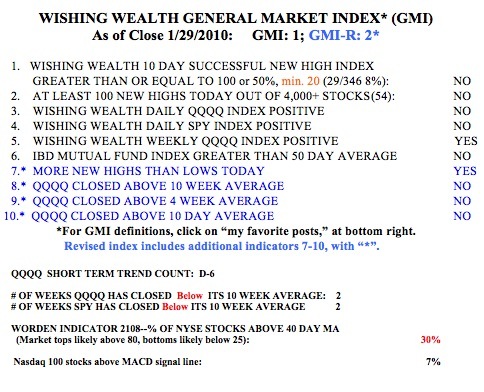 I subsequently added four more indicators to the GMI in the form of the GMI-R (revised). The added indicators count whether there are more daily new highs than lows, and how the QQQQ has performed in relation to three moving averages. I become very defensive in my trading portfolio when the GMI is less than 4 and consider going to cash. When the GMI goes to zero, I also start going to cash in my more conservative university pension account, which allows me to trade its contents only a few times each year. So, with the GMI currently at 1, I am totally in cash in my IRA trading account. I trade only with the trend. Why fight the tide? And the tide is going out. There were only 54 stocks in my universe of 4,000 stocks that hit a new 52 week high on Friday and only 8% of the 346 stocks that hit a new high 10 days ago closed higher on Friday than they did 10 days ago. Thus, buying stocks at new highs is now a low probability bet for me. The QQQQ is in the 6th day of a short term decline (D-6). The preceding short term up-trend ended after 51 days, by my count. The QQQQ and SPY ETF’s have closed below their critical 10 week averages for 2 weeks. And only 7% of the NASDAQ 100 stocks closed with their MACD above its signal line. This is not the time for me to go long. So I could trade on the short side in my IRA by buying put options or inverse ETF’s that rise as stocks decline. But with the longer term trend still up, the short term decline can end abruptly, catching me with my shorts down (pun intended!). With the Worden T2108 Indicator at 30%, we are beginning to get into oversold levels where a bottom is possible. If, we get below 20%, I would start to expect some type of rebound. Professor, I took your class a couple of years ago. I was wondering what this semester’s reading list is. If there are any additions from what I read 3 years ago, I would like to look them up and read them myself. When discussing the longer term trend, what specific data are you referring to? I rely heavily on Stan Weinstein’s Stage Analysis (see book to lower right) for identifying the longer trend. In a Stage 2 advance, the averages are above a rising 30 week moving average. I become bearish on the longer term trend when the 30 week average curves down. You keep giving us very useful info. Thanks! Would it be possible to show us some of the Guppy charts from other periods of time when the market was changing. For comparison sake? It turned up in March long before the prices were over the 30 week average. I know you need to wait for confirmation of a new trend but the Guppy charts seem to be pretty accurate. Thanks.